Original black sleeve, only the most faintly visible surface wear - the grooves are tight and it plays through crystal clear with no background fuzz/hiss, no pos, skips, or breaks - please use a quality needle - this is a Hip Hop artifact with few peers. This is a 'raw' copy and I would recommend no cleaners, brushes, or solutions - sonic cleaning ONLY. In fact, I doubt any attempts to clean this vinyl have been made and experience tells me that after a good sonic cleaning it'll sound better than the day it was pressed even. The cutting process always leaves micro shavings of vinyl lodged in the bottom on grooves which only the sonically created bubbles are small enough to agitate out. Runout Matrix EMPL 01A/01B. E.P. 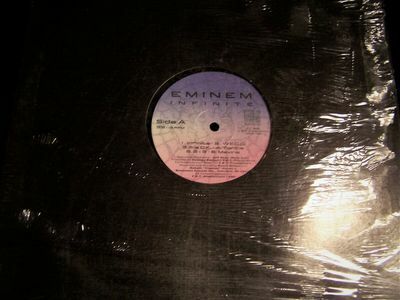 12" Unofficial release (this was not one of the approximate seventy albums Eminem said he sold out of his car when he worked as a dishwasher - if you are looking for that pressing, good luck). I will continue to add information and more detailed pictures Sunday and will answer messages as I am able. If you're looking for more Detroit early issue vinyl, I also have a couple of nice K.I.S.S. LPs (Love Gun, The Originals) pictured above.